Combining the latest lighting technology along with an array of features while maintaining a compact design make the Pelican 7600 one of the best all round law enforcement flashlights available. 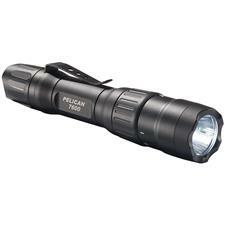 Performance surpassing 900 lumens coupled with a USB rechargeable lithium ion battery are just the beginning of this multi-talented product. In addition to the extreme high performance white LED light output, a red and green LED are included. These additional colors provide values such as night vision preservation and can be used for traffic control when partnered with a slip-on wand accessory. The 7600 provides high, strobe, medium and low modes. You are able to choose from 5 different programs to personalize these modes to you liking. The full time battery level indicator ensures you will always know where your battery status is. Plated with a Type III hard anodizing finish provides the most robust finish. The ability to use disposable CR123 batteries if power is unavailable ensures youll never be without light when it is needed most. The removable pocket clip and its IPX8 submersible status rounds out the many features on the Pelican 7600.